The best beach is an empty beach and is usually hard to get to. That's how you weed out the masses. Let the masses stay in town, on towels separated by mere inches on the sand. If you're willing to spend a few (or ten) hours on the road you'll be well rewarded on the Wild Coast South Africa. This region, also called the Transkei, is home to Xhosa people and I felt very welcomed everywhere we stopped. The area is also famous for being home to the one and only Nelson Mandela. We spent the night before in Durban, to the north, so we had a long drive ahead of us. It took us ten hours to get to our hostel. That's a lie, it took us 12, but it's because I missed a turn. It should have taken ten. If you're coming from Chintsa or East London in the south it should take around 4-5 hours. Despite the distance, I think the Wild Coast should be on every South African itinerary. The Wild Coast, or Transkei, stretches from East London northwards along the coast to the Kwa-Zulu Natal province (towards Durban). The N2 highway crosses the region and is easy to drive and very well-maintained. The bulk of the drive is on this smooth highway and is an easy drive. When you turn off the highway towards the coast is when it gets a bit dicey, read: potholes and the Transkei Big 5. You need to budget your time to make sure you're driving with daylight. The smaller roads aren't lit and there is livestock freely roaming the roads. If you'd rather not drive yourself, take the Baz Bus, a backpacker's dream! Renting a car isn't always possible. Maybe you're too young, or maybe you're traveling alone. The Baz Bus is a hop-on-hop-off bus network connecting hostels around the country. You can buy a one way ticket from Cape Town to Johannesburg, stopping wherever you'd like along the way! BAZ BUS OPTIONS | You can purchase passes by the week (such as this 7 day pass with a Cape Town departure) or a longer pass up to 21 days (such as this one also originating in Cape Town). You can choose to depart from Johannesburg, Durban or Port Elizabeth. The Transkei is a large region and it's not exactly easy to hop from village to village along the coast. You'll likely have to retrace your steps back to the N2 highway. There isn't exactly a highway along the coast (but that's why this is such a stunning place to visit!). So choose wisely. We chose to stay near Coffee Bay at the Mdumbi Backpackers hostel. I chose it because it is very focused on involvement with local community and sustainable tourism. There's a kindergarten for the community built on the hostel grounds, local Xhosa Mama's cook food for the guests, locals offer tours around the village; staying here you can be sure your money is going to the right place. And speaking of money, it's very affordable. We rented a private rondavel for three nights and ate three meals a day, spending a total of U$125. If you're traveling on a particularly tight budget you can rent a bed in one of the dorms and bring your own food to cook or grill. Mdumbi is near Coffee Bay. It's common to hike out to the famous Hole in the Wall in Coffee Bay from Mdumbi and some people even drive there to spend the day. 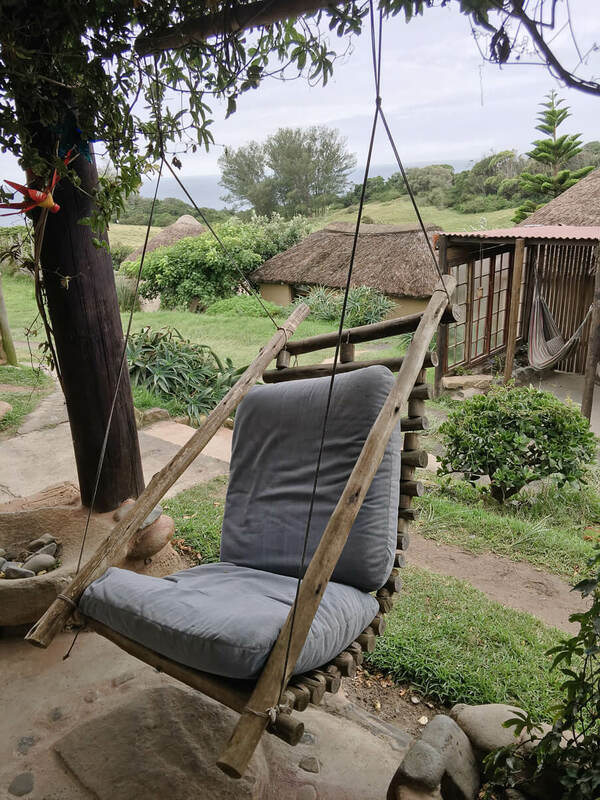 There are more hotels and backpackers options here so if you'd like something slightly less isolated than Mdumbi check out Friends Wild Coast Backpackers or the Ocean View Hotel. Wild Lubanzi is actually one of the places I REALLY wanted to visit on the Wild Coast. Unfortunately, they were closed to remodel while we were there. But that's great news for you because it appears to me that they've done an excellent job! Wild Lubanzi is located south of Coffee Bay. It appears similar to Mdumbi in that it looks isolated (in all the right ways). Rent their tent accommodation that's built onto wooden platforms with perfect views of the endless coastline. Check rates here. We spent three days doing absolutely nothing. We spent our time either walking along the beach or asleep in a hammock. It's the Indian Ocean but the water was freezing, so we didn't swim. However, the water is perfect for surfers and there were a lot staying at the backpackers. South Africa is friendly to early risers and one morning we even walked down to the beach at 6:30 and surprisingly we weren't the first ones there. There were surfers, someone was going on a run along the beach, and there were moms walking their children down the beach to the kindergarten. It may sound crazy to wake up so early on vacation, and I suppose it is, but we just woke up naturally with the sun for most of our trip. The only time we ventured further afield was on a tour of the village with two local guys. They took us to the local shebeen (licensed bar) and into their homes. We spent a few hours with them just wandering the paths worn in among the rondavels. They showed us how the women cook and prepare the traditional Xhosa bread over the fire outside and introduced us to their families. Mdumbi works with people from the village and trains them to give tours and excursions. Choosing to go on a tour is a great way to support the local community while also getting see the village or other points of interest that you wouldn't see without a guide. Aside from cultural tours, they also offer tours to nearby caves with cliff jumping, kayaking, massages and, of course, surfing. Cool Bananas is the only store near Mdumbi Backpackers. You can grab chips, snacks and some produce, but the stock is limited so you should bring your groceries with you if you want to cook. We chose to eat at the hostel. The dinners were whatever the Xhosa mama's cooked that night and they never disappointed. For breakfast and lunch, there was a small but delicious menu to choose from. 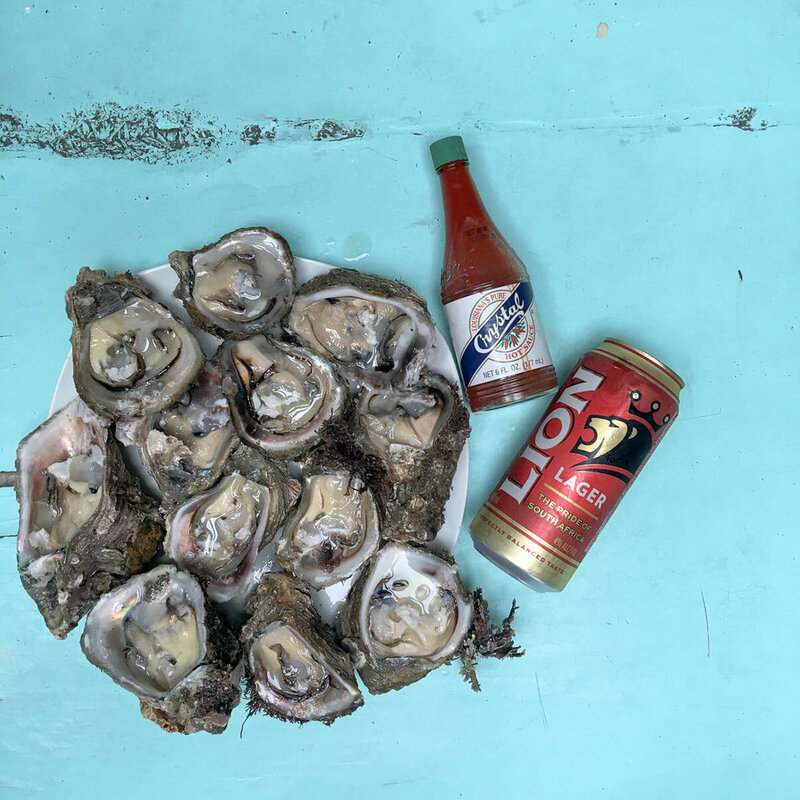 For one meal Martin bought a dozen fresh from the sea oysters from a local girl for $2 US. Fishermen are eager to sell you their catch, but the hostel will tell you what is in season and legal to catch so make sure to check before you buy. There is a restaurant and tavern in the village as well. If you're a beer aficionado you can go to the local shebeen and try Xhosa beer (above in milk cartons). You can pick some up in the local shebeen. I'm not a beer drinker but I was told it was very unique! It may not be easy to get to but it is absolutely worth it. 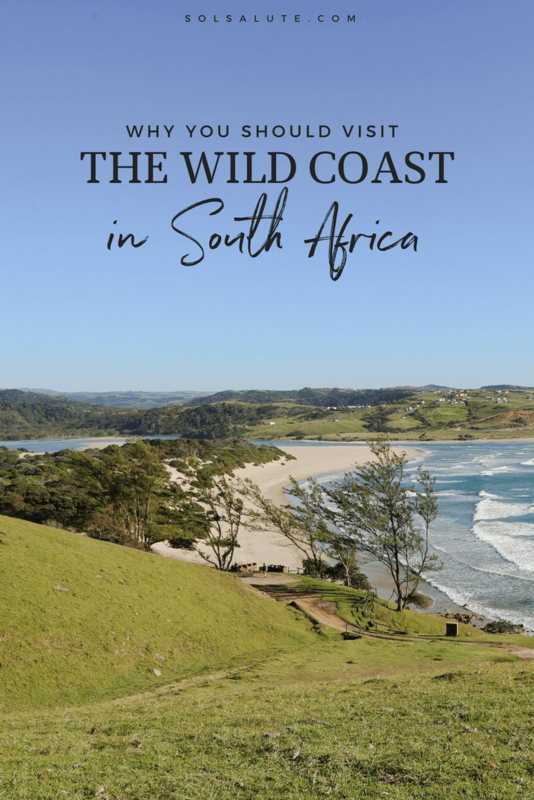 The Wild Coast was one of the highlights of our month in South Africa. There's nothing like the breathtaking, rolling green hills and cliffs dropping off over seemingly endless beaches. If you can make this destination fit into your itinerary then don't think twice.